This post was created in partnership with Glutino. My husband and I lived in San Diego for the first couple years we were married. 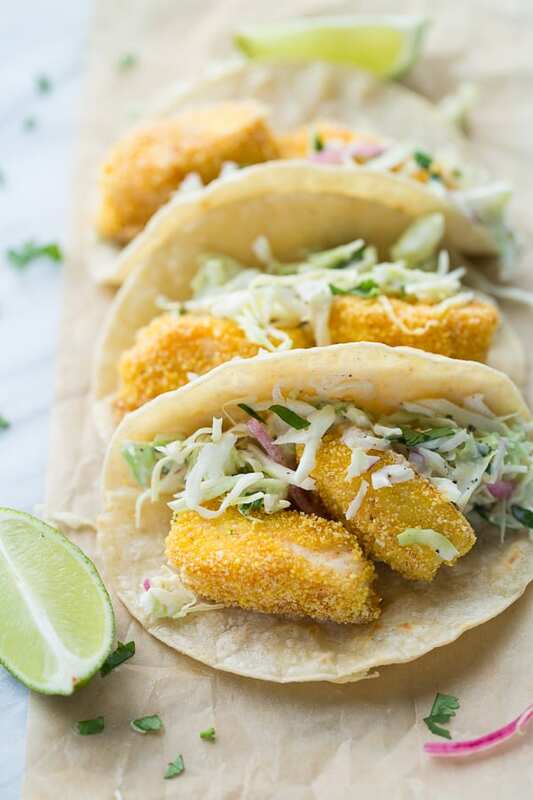 I used to think I didn’t like fish tacos, but I soon realized it was because I had never experienced real fish tacos. The first time we went to “Taco Tuesday” at a local taco place I was highly skeptical. However, after the first bite I fell in love with the lightly breaded crispy white fish, thinly sliced coleslaw, and creamy sauce. There was no looking back and Taco Tuesday became an after-work tradition for my husband and I every week. Taco Tuesday is something I’ve missed since going gluten-free, but a few months ago I dropped my kids off at my parents house for a few hours and my Dad told me to come in and taste something he had made. My Mom eats gluten-free too and my Dad always cooks delicious things for her. He had made fish tacos! He made them by coating the fish in a mixture of cornmeal with a bunch of delicious spices that made the fish taste so good. He topped the tacos with some lightly dressed coleslaw. It was the perfect bite. My Dad usually cooks by feel, but I had him jot down the recipe on the spot so I could recreate it! 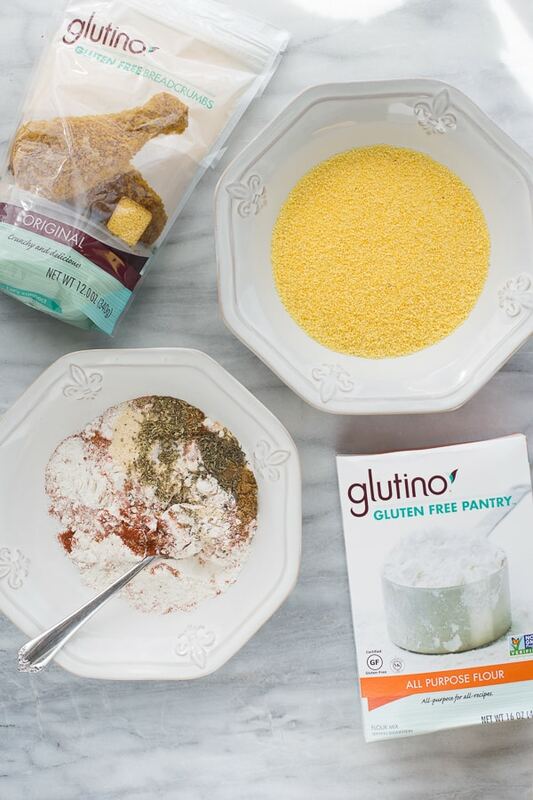 Glutino breadcrumbs are made of cornmeal and work perfectly in this recipe! 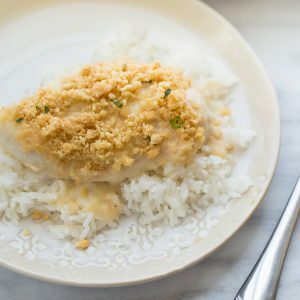 I also like to dredge the fish in a little flour mixture and milk before coating it with the seasoned cornmeal so the fish gets extra crispy. The coating on these tacos is light and crispy. 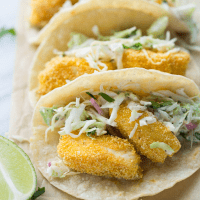 I like using tilapia in these tacos because it is a nice, firm fish that holds up nicely with the breading. For these tacos, I also like to keep the toppings simple with with my favorite coleslaw, lime juice and maybe a few pickled onions. 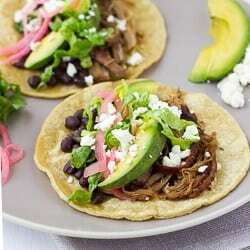 This recipe has happily brought Taco Tuesday back into my life! 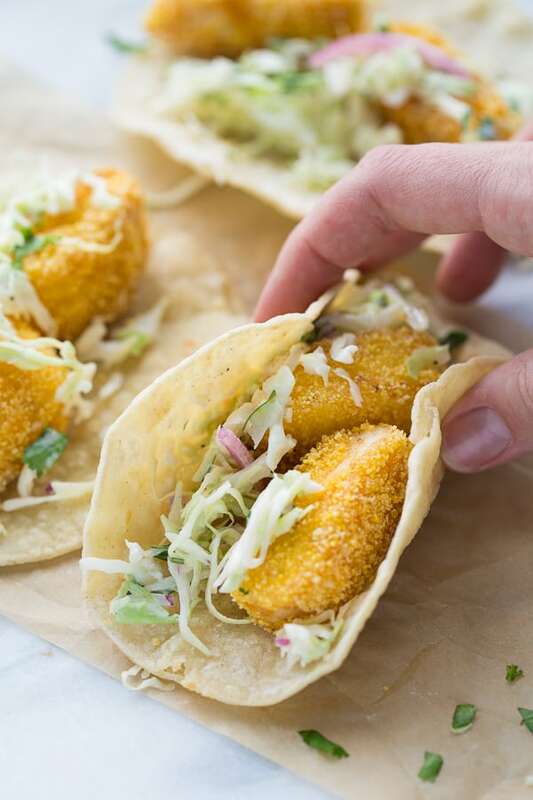 You have to try these next Taco Tuesday! Slice the tilapia into 1-inch, even rectangles. Season with salt. Set out 3 bowls for dredging. Place the milk, lime juice and honey in one bowl and whisk vigorously with a fork to get the honey to dissolve. Place the gluten-free flour in another bowl. Place the Glutino breadcrumbs or cornmeal and spices in the third bowl. Mix to evenly combine. Coat the fish by first dredging in the flour. Shake off the excess then place in the milk mixture. Last, coat the fish in the seasoned bread crumbs shaking off any excess. Repeat with each piece. In a medium-large non-stick or cast iron skillet, heat about 1/2 an inch of avocado oil to shallow fry the fish. Heat the oil over medium-high heat until hot and the fish sizzles when you add it to cook. Working in batches, cook the fish for 2-3 minutes, turning every 20 seconds or so until golden, crispy and cooked through. Place on a paper towel lined plate to drain. 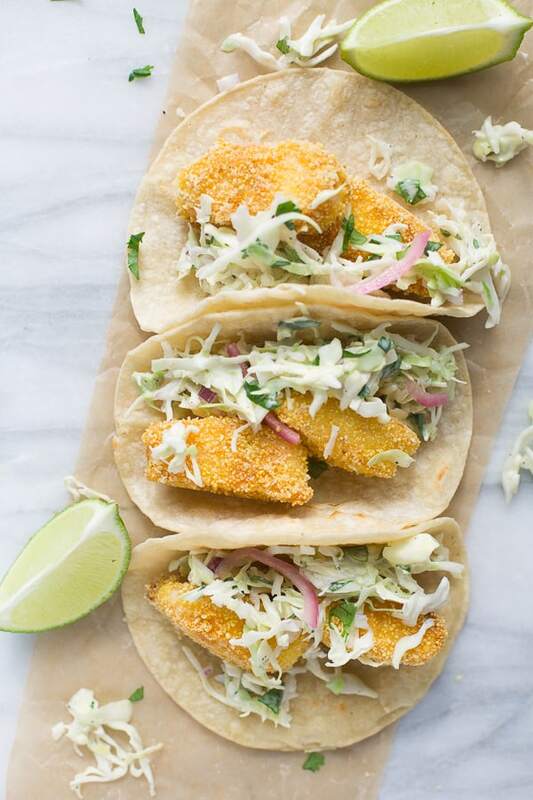 Serve by placing 2-3 fish chunks in each taco. 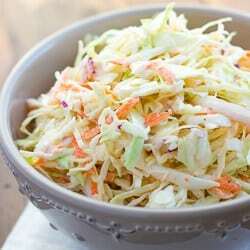 Top with coleslaw, cilantro and lime juice and enjoy!